About - Haven Dance Academy - Ballet, Tap, Jazz, Modern & Hip Hop Dance Classes for toddlers to adults! If you had asked me when I was eight years old what I wanted to be when I grew up, my answer would always be a mom, a dance teacher, a studio owner. Now I can proudly say I have achieved all three. Haven Dance Academy has been a dream a long time in the making and I couldn’t be more excited to see it come to fruition. 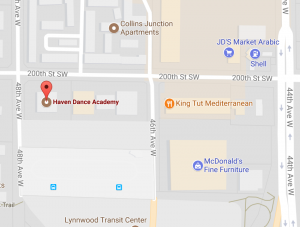 The name Haven Dance Academy came from the desire for this studio to be a safe haven for myself and all who enter its doors. You can always expect teachers of the highest caliber that focus on not only proper dance technique, but the dancer as a whole. I know 2016 is the start of many amazing seasons of Haven Dance Academy, and I look forward to inspiring dancers young and old for many years to come.